Jessica Mastorakos currently lives in San Diego, Calif., where her husband, a U.S. Marine, is stationed. They are blessed with two sweet babies, Leo & Zoe. Jessica has a Master’s in Psychology from Grand Canyon University, and when she’s not writing, she’s selling natural skin care products for Perfectly Posh. Her inspiration for her military romance series was her life as a Marine wife, and as complicated as it can be to navigate military life, she wouldn’t trade it for the world. 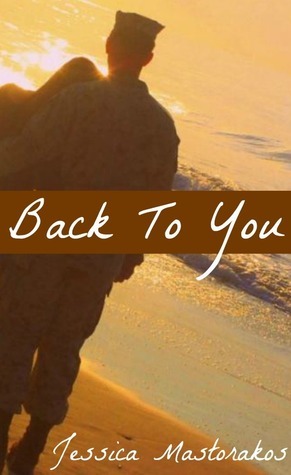 For a chance to win a copy of Back to You, visit Jessica’s Facebook page, or click here to join the Reader Appreciation Author Hop. Spencer knows what Ellie wants for herself. In fact, he thinks she deserves every bit of it. She sure as hell deserves more than what he can offer her. But as he gets ready to leave for Marine Corps Recruit Training, he starts to think about exactly what he’ll be leaving behind. As the weeks of training drag on, he can’t help but think that if it weren’t for the shadows of his past, he would make her his future.